The patch boxes called QE3K and QE9K are cabinets for lodging the management electronic for systems such as environmental monitoring stations using data logger made by Siap+Micros. They differ mainly for the primary supply system – 220 Vac power supply or solar panel – and consequently for the backup battery size used (from 1.2 Ah to 120 Ah). Depending on the installation environment, they can be made by polyester or stainless steel, both version are insulated, equipped with aerators for a natural ventilation and fairlead for electric wiring, with an IP65 protection degree. The stainless steel version can be made (as option) equipped with an armor-plate, made in stainless steel too, weld and equipped with armoured lock. 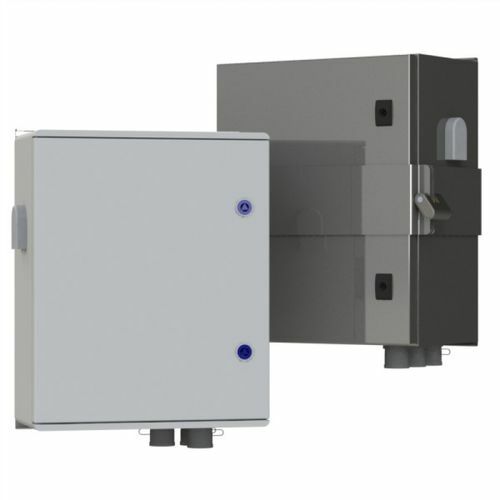 The 220 Vac current supply versions are equipped with a supply and internal protection system made by anti-noising filter, magnetothermic switch and 12 Vdc feeder in order to supply the variety of internal devices.